As announced during the Sonic panel at SXSW in Austin, TX this morning, the SEGA online shop began selling a bundle of the first four issues of the new Sonic the Hedgehog comic from IDW Comics. 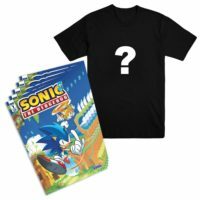 The bundle includes Sonic the Hedgehog issues #1-4, specifically the A cover variants which make an interlocking cover by artist Tyson Hesse, along with an exclusive variant of Sonic the Hedgehog #4 and a bundle-only t-shirt. The bundle is scheduled to ship on May 1st, with preorders open now. For folks who want to read the comics, buying each in-store or online individually may be a smarter bet, but those looking for exclusive merchandise or variant covers may want to hop over to SEGA Shop to place a preorder.